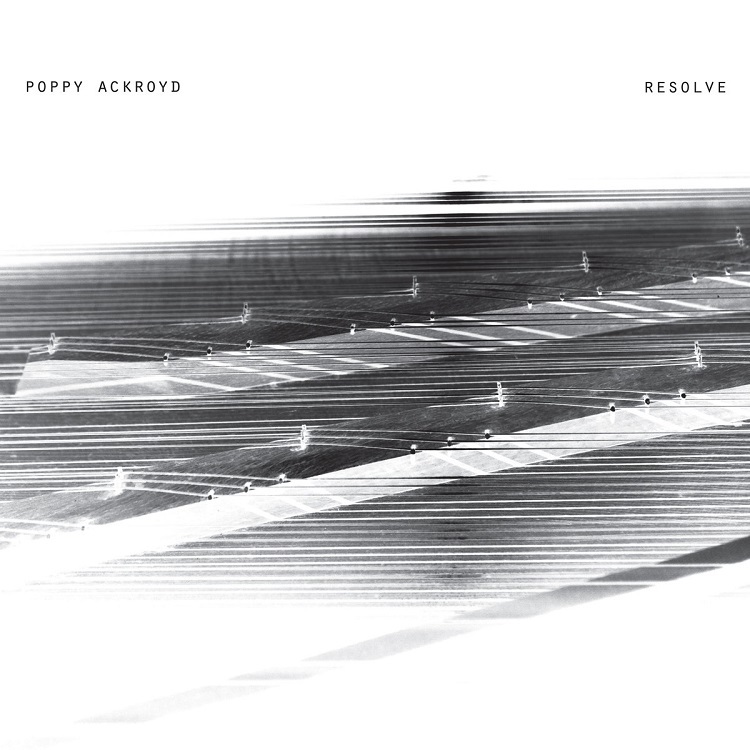 As with my previous albums the bulk of ‚Resolve‘ is made up of piano and violin sounds. All of the piano and violin recordings were recorded in my home studio in Brighton using mainly my Bluthner grand piano. For this album I invited three guest players to record and improvise. I recorded Mike Lesirge (flute, clarinet and bass clarinet) and Jo Quail (cello) in my partner Joe Acheson’s studio (in the basement of our house in Brighton), and I recorded Manu Delago (hang) in London at Alev Lenz’s studio in Shoreditch. As soon as this track was finished I knew it would be the opening track on the album. I wanted it to feel like the track was moving towards you at the start and building until you were immersed in it. The opening beats and sounds are made inside the piano with paper laid over the strings. Using my palms and fingers I tapped and brushed the paper against the strings to create the different sounds. The other opening textures are mostly made from plucked inside piano sounds with delay, and high piano riffs. The track started as a solo piano piece that gradually became more and more disguised by the other more repetitive elements. The strings are mostly violin with some cello (performed by Jo Quail). There is also flute, clarinet and bass clarinet in parts. This started as a solo piano piece and the rest of the track developed naturally around it. For the first time I wanted the string section to feel quite large – usually I am going for a more intimate feel. I liked the idea that it might feel like it was swooping in to the track and then taking over. This track mostly features sounds from the clarinet and bass clarinet (performed by Mike Lesirge). Mike came down to Brighton to record in early 2017. We recorded my scored parts for the other tracks he was featuring on first and then finished with this track. We started with a scored melody and chord sequence which Mike layered up bit by bit, playing the parst with his own particular feel. Once that was down I then asked him to improvise percussive sounds over the top of this. We did a few takes on the clarinet and then again on the bass clarinet. We also tried some whistles but there wasn’t room in the end for these. After the session I sifted through all the scored recordings, choosing the best takes and then sifted through the improvised recordings to find the most interesting sounds and rhythms. I then played around with these sounds, combining them in different ways until I ended up with beats and textures that I felt really worked. The sounds you hear on this track (and on most of the album) are although very much edited and arranged differently from the original recordings are not really manipulated or affected sonically. Once I had all the percussion and melodic ideas for the clarinets I started to build the tracks structure, improvising pianos ideas over the top and then choosing, rearranging and editing these. The middle section was the final part of this track to be added. I felt that the track needed a break from the clarinets in the middle and so this part – including the percussion – is all created using the piano. This track is mostly made from cello recordings. Jo Quail came down to record for me in Brighton and we worked in much the same way as I did with Mike. As well as recording many scored parts for the rest of the album we also created a track involving improvisation. This time we started with just a chord sequence. I asked her to play different layers for the track, giving her ideas but also freedom. After the session I then went through and took all my favourite nuggets and used them to build the structure of the track. All of the percussion on this track is built from sounds created during improvised percussion takes by Jo. The track starts with cello harmonics, and this is one of my favourite parts of the album. I love how imperfect and scratchy some of them are, it somehow makes them more beautiful. They were originally just longer notes from one take that I then chopped up and arranged to create the ‚melody‘ you hear at the start. Over the top of the cellos is piano and plucked inside piano sounds. This track also started as a solo piano piece but it is one that I have been working on in live shows for a few years now. The original track is very much audible throughout this version. It is based on a melodic idea that I came up with years ago in Goa, India whilst looking out to sea. The percussion in this track is all cello. After Jo recorded her scored parts for this track I also asked her to improvise a little percussion and I have selected and edited a few sounds from this to make the beats and percussive ideas that you hear throughout the track. The scored woodwind parts are performed by Mike Lesirge. This is one of the first tracks recorded on the album and the first recordings of it were actually made in my previous studio. Therefore some of the piano is recorded on an upright as my grand piano was in storage whilst I was in that studio. This is the only track on the album where all the sounds are made using only the piano and violin. The percussion is created using both instruments. This track features Manu Delago on hang. We met and recorded at Alev Lenz’s studio in East London. Having never worked with hang before, I took along a few scores and ideas to work with as I wasn’t sure what would work. Manu brought his three hangs with him, and so we had the full chromatic scale. I was really excited to work on this track as I had recently done a remix for Manu and when adding piano parts to his stems on the track I loved the way the piano and hang sounded together. We did several takes of the melodies and bass lines and then added some other improvised parts around the chord sequences, before recording some slides and an array of rhythms and percussive sounds using hands, fingers and beaters and anything that was lying around the studio. As with „The Calm Before“ and „Quail“, I tried to use mostly just the sounds from a single instrument on the track. I picked my favourite parts of the improvisations, arranged and built the track with them. There is actually also quite a lot of piano on this track but I think the two instruments work so well together. This track is almost totally created with piano and violin sounds, but there is a little bit of woodwind (flutes and clarinets). All the percussion is made from sounds recorded inside the piano and on the piano frame. This track began life as the soundtrack to a short animation by Ainslie Henderson. The film won us a BAFTA in late 2015. The animation is of stop frame puppets that are made from discarded electronic objects and dried flowers. The music is meant to sound mechanical and childlike, as well as nostalgic and ominous. I reworked the track slightly for the album, and at one point considered making it longer but I think due to the nature of the sounds it works perfectly as an awkward short track, something quite different from the rest of the pieces. The main melody on this track is created using a pianino that I sampled in the keyboard museum in Edinburgh when I was recording for Feathers. The pianino is a very small keyboard with hard beaters that are triggered by the keys and hitting metal chime bars. It has a slightly wonky, dead and percussive tone. This is mixed with a few layers of melody played on several wine glasses. Everything is intentionally just a little bit out of tune. The rest of the sounds are made using piano with some layers of harmonium. This track was composed for a collaboration with visual artist Jola Kudela, who approached me wanting to make a music video for one of my tracks. We met and I really liked her energy and so I decided to write something new for her. We discussed subjects and then started to work on ideas. The idea of trains and train journeys came up – perhaps as we were meeting in Borough Market in London with the railway arches just outside London Bridge station in full view. The track is made using mostly piano and violin, with some cello lines from Jo Quail to beef up the bass in the string sections. The idea behind the track is to tell the story of a train journey (specifically the one from Brighton to London) starting from the alarms the doors make before the train departs. Some of the percussion is irregular, imitating the unpredictable sounds from the wheels on the track, and some is constant, alluding to the speed of the train. The sections change but the feeling of movement remains. I wanted to convey the feeling of traveling through tunnels and changing scenery on a train journey.